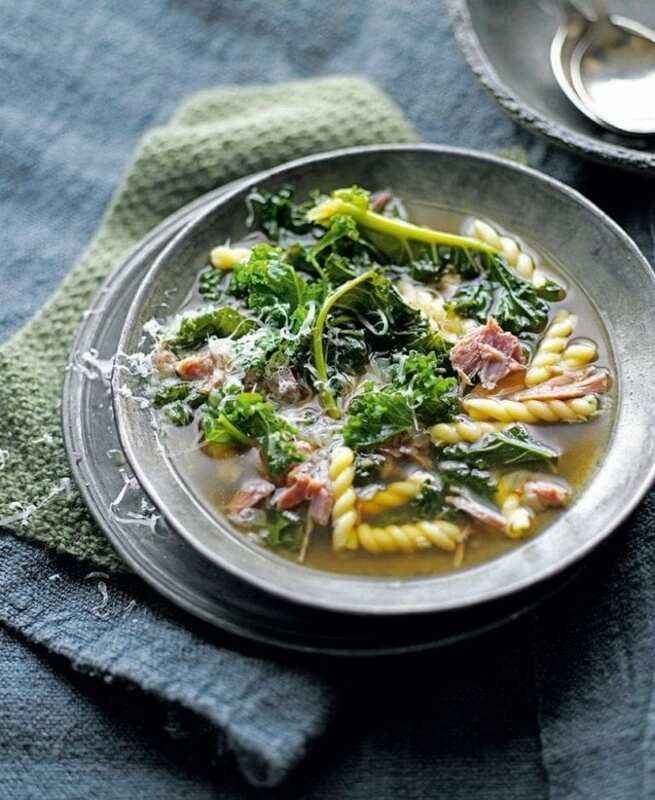 A simple and comforting ham, kale and pasta soup recipe – perfect for warming you up on a wintry day. Finely slice the onion and put in a deep saucepan set over a medium heat with a drizzle of olive oil. Fry, stirring often, for 10 minutes or so until soft, translucent and beginning to turn golden. Crush in the garlic, then add the kale. Season, stir, then pour in the chicken stock. Bring to a simmer, then cook for 10 minutes. Meanwhile put the pasta in a large pan of salted water and bring to the boil. When the pasta is nearly cooked al dente, drain and transfer to the soup pan, along with the ham. Gently heat for 2-3 minutes. Squeeze in a little lemon juice, taste and season, then ladle into bowls. Top with plenty of grated gruyère cheese, then serve immediately.